Man may be of the east or the west, he may be a rich or a poor, black or white, what he needs, what he seeks is only peace and happiness. Though he is seeking peace, yet the ways, the means or the apparatus which he or she is using, are leading him towards pain, sorrow and agony because the joy which he is gaining from the gross world is all either superfluous one or from the external materialistic world which can be perceived through the senses only. So the pleasure which is being gained by the senses which is leading ultimately towards darkness and death, he is in search of that Supreme eternal unfading beauty and perennial joy by various pros and cons and also many investigations. The story is not the new one to the human constitution but it is from the creation itself, in time immemorial from the birth of the very first man on the earth. Man is industrious one to seek, to find, to enter progress towards the very prosperity only through which he can establish in the realm of Supreme Blessed One. Absolute realisation of all these races has brought a very subtle understanding that the cause of the sorrows does not lie in external environment or the world but it is an iceberg within the individual one. The very mind of the man ids the only mischief mongering matter to create desires after desires and in fulfilling the same search of peace, man is in the pieces. In general phenomenon a physician investigates patients with various medical machines and teats the patient which brings ultimately a sound health to him. But in case of mind one is to check the mind with his own mind only and a media which is used to mind the mind is again mind only. So in first case we are totally gross whereas in another we are absolutely subtle. So we can say a journey from gross to the subtle is the Science of Yoga. According to Maharshi Patanjali this is known as Ashtanga Yoga which brings an education or a syllabus of eight – fold of discipline for the achievement of absolute peace through the discipline of this Yogic Science. 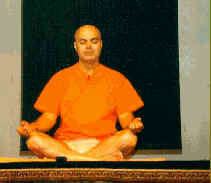 But again individual discipline, social discipline, physical discipline, vital discipline, sensual, mental, intellectual and cosmic discipline which is known as Yama, Niyama, Asana, Pranayama, Pratyahara, Dharna, Dhyana, and Samadhi were not possible to achieve directly one after another, step by step or at a time altogether by some psychic remedy. So the scientist sage had an invention of the middle path to commence for the achievement of the worthy goal with the help of discipline his own body. As in the locomotive engine the fire, water, steam, piston, cylinder, connecting rod, fly-wheel, engine and train are linked with each other and the checking of the steam is making the possible check in entire train itself. In the like manner, the discipline of the body brought the discipline of Prana, senses, mind, intellect etc. one after another. But it was so smooth, it was hard and stiff against the will of mind because it was not so easy. It became famous with the name of Hatha Yoga. The Yoga which is being practised forcefully in the beginning stage was like breaking of a strong rock for bringing out a Spring of Sweet Water. Hatha Yoga which is known to the modern man as a term of “Yoga” brings harmony in different systems of the physiological values of the individual one. In the environment and the tension in which the modern man is crushed physically, economically, psychologically, mentally and so on, the science of yoga has brought a new hope for the modern man. Even a little yogic exercises practiced scientifically, systematically and regularly can bring an immense result in the investigation of the modern medical apparatus and have declared a practitioner of yoga asanas and pranayama as an unusual, abnormal supreme health possessing personality. The respiratory system which can be measured through the computerized electronic gadgets or the circulatory system shows a valuable eras of the sound and perfect health. In the indigestion, gas formation, constipation, loss of appetite, insomnia, hyper-acidity, cervical spondilitis and migraine or common tension like diseases, has brought amazing result by the sincere practice of Yoga Asanas, Pranayama , Kriyas etc. Little practice of deep breathing and Shava Asanas has made a miracle in the direction of the daily need of physical and mental relaxation. One can become free, live and lead a very healthy and strong life with even little practice of this art of relaxation even after serious cardiac attack. We are constituted with three kinds of nature, namely, Satva, Rajas and Tamas. Regular practice of Yoga Asanas and Pranayama makes man free from the clutch of callousness or Tamas and slowly and gradually, very silently our entire Rajasic nature merges in the Satva, the purity. With this practice we can lead a real life of harmony and balance – a life of sincerity and purity, a life of non-irritation, calmness, presence of mind and culmination. What else we need? The growth of science, investigations and inventions of modern gadgets of electronics have made a man a simple slave and a person with no patience and discrimination. He has become a simple racket of very lower nature, of lust and anger, jealousy an ego. Regular and sincere perseverance in the field of Yogic practice can bring an amazing hidden power, a great magazine of the eternal strength to strive against these devilish traits and can uplift us towards the bright and shining prosperous future or the horizon of the Divine Life. This is the message of our culture. This is the lofty teaching of our heritage. Yoga is a way of life. May you love our motherland, the Bharat Varsha, its culture, and by putting it in our daily practice, we bring real peace in our life!